With Aristotle, as he himself expressly noted in his paper De sensu et sensibili (On Sense and Sensible Objects), we required seven colours to connect the extremes of black and white. Aristotle does not always give the same names to the steps of his scale — grey can occur between blue and black, thus displacing yellow to the opposite end — but it is always seven colours. We find this number again, although without specifically allocated names, in the early 13th century with Robert Grosseteste, the first chancellor of Oxford university. With the publication of his book De colore, Grosseteste added a new dimension to our cultural history. He had translated the works of Aristotle, and conceived a new view of the world which became known as a «grandiose metaphysical interpretation of light». As «prima materia», light provided him with the primary physical form, with space being a function of «lux», perceivable in its seven colours. Grosseteste became aware that colours were not only to be defined according to their brilliance or saturation — we will explain more closely what is meant by these terms — but that their brightness or whiteness also seemed to play a part. A bright, shining red can be very easily distinguished from a grey, dark red, and is also described in another way. Grosseteste retained the black-white axis, but he removed them from the classical straight line, to turn them through a right angle. By placing his seven equal — value basic colours across the axis between white (Lux clara or Albedo) and black (Lux obscura or Nigredo), he opens up a new dimension for colour systems. Grosseteste imagined that Lux clara descended to the colours — by means of a procedure which he named «remission» — and that Lux obscura ascended to the colours — by means of «intention». We do not know which colours he wished to see arranged linearly at the midpoint between Albedo and Nigredo. Black and white were probably not among them (illustration), implying that Grosseteste was the first to distinguish between the two colour types nowadays known as achromatic (namely, black, grey and white) and chromatic (all others). A glance at the still linear scale of the six «colori semplici», which we also find with Leonardo da Vinci in about 1510, will reveal that this segregation of actual colours — as they are sometimes known — was in reality both difficult and disputed. Noteworthy in Leonardo’s straight — lined arrangement, however, is the series of chromatic colours — giallo, verde, azzuro, rosso, thus yellow, green, blue and red — which form a contrast to the patterns of Antiquity and at the same time begin to resemble the established psychological sequence of modern times, which we will later explain in more detail. Leonardo was interested in colours as a painter, hesitating at first to adopt green, since green can be obtained as a mixture of yellow and blue. Here, we can for the first time recognise a difference which was to become significant in later systems — the difference between primary and (corresponding) secondary colours. The allocation of colours is very much dependent on the originator of a particular colour system and the purposes he intended to fulfil. The colour green certainly belongs to both categories, since from a physical point of view it is a primary colour, but it is a secondary colour as far as the technique of painting is concerned (see above). In the course of examining other colour systems, we will often be confronted with such dichotomies. Colours are formed and blended in many different ways. While Leonardo deliberated over colours, he was already aware of the arrangement put forward in 1435 by his fellow countryman Leon Battista Alberti. This makes do with four (actual) colours which form a rectangle in our illustration — yellow (giallo. G), green (verde. V), blue (blu. B), red (rosso. 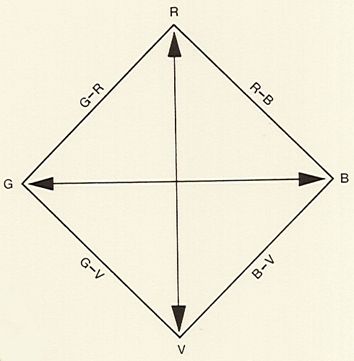 R) — and thus serve as the base of a double pyramid with the achromatic extremes placed in the corners (illustration). It is clear that the seven colours used by Grosseteste had been abandoned by this time, the reason probably being a new theory of the rainbow which had been put forward in the early 14th century. In Antiquity, Aristotle had initially discovered only three colours, which he identified as red, green and blue. Other ideas first emerged in the year 1000 or thereabouts, as the Middle Ages became occupied with optical experiments, and in about 1310 the Dominican monk Dietrich von Freiberg finally linked many of his observations to his recognition that four colours are spread across the sky in front of dark clouds. He named them red, yellow, green and blue, and spoke of primary «median colours», all of which can be mixed together. However, it was not until the19th century that a distinction was drawn between the reflection of light from a surface and the refraction of light occurring, for example, in a rainbow. Nevertheless, what we experience here is an early form of scientific knowledge of colours, which the colour theorists of the Renaissance were then able to adopt. Leon Battista Alberti wished to take this particular development a step further, in order to originate a suitable system for mixing paints, providing a «ratio colorandi», as he called it. He has not handed a pictorial representation of his ideas down to us, and only wrote a few lines on this subject in Della pittura, his 1435 book on painting. We have reproduced his arrangement, based on suggestions made by the American art historian Charles Parkhurst, who places the four basic colours within a closed system — for example a square, although a circle could equally take its place — since they can be mixed in pairs as paints to allow the artist to aim at all possible transitions. Again, black and white assume their own dimensions, with the four previously mentioned chromatic colours all having equal spacing. Because Alberti’s four elements should correspond to the four «veri colori», there are problems with yellow, which cannot be allocated in a suitable way and was later replaced by Alberti with grey: red corresponds to fire, blue to air, green belongs to water and grey to the earth. In Alberti’s case, there was no fourth primary colour, but a mean value between the absolute values of black and white, and the resultant grey was seen by him as the colour of the earth. If we now exchange this grey for yellow, we will depart from his system and return once again to Aristotle. If the reconstruction is correct, then Alberti was the originator of a colour circle — at least at first glance. But when Parkhurst, together with his colleague Robert L. Feller, systematically researched the invention of the «colour wheel», they were able to show that Grosseteste’s diagram can be understood spacially, in the way shown. (A circular arrangement of colours had also been mentioned by Albertus Magnus as early as the 13th century). Grosseteste himself remarks very generally that the entire cosmos arose from primaeval light, and that philosophy cannot be understood without «figures». He had certainly — and demonstrably — understood the term «figures» to be three-dimensional objects. The Oxford academic otherwise had no special application for colours in mind, being concerned solely with general theory. In this respect, his contribution had actually succeeded because, well into the 20th century, we will once again encounter his basic concept of placing all colours at the same distance from white and black. Grosseteste’s ideas anticipate all systems which take the form of a double cone based on colour hues of equal brightness. With colours, too, is there nothing new under the sun? Indeed there is, but on a less superficial level. As the two Americans discovered, the history of colour wheels appears to have neither beginning nor end — just like the circle of colours itself, made possible by the light of the sun and our own eyes. Date: Middle Ages to Early Renaissance. Basic colours: Robert Grosseteste: 7 (unknown) basic colours between “Lux clara” and “Lux obscura”; Alberti: yellow, green, blue, red; Leonardo da Vinci: white, yellow, green, blue, red, black. Bibliography: R. Grosseteste, «De colore», ca. 1230; L. B. Alberti, «Della pittura», 1435; L. B. Alberti, «Opere volgari», 3 volumes., edited by C. Grayson, 1960 / 1973; Ch. 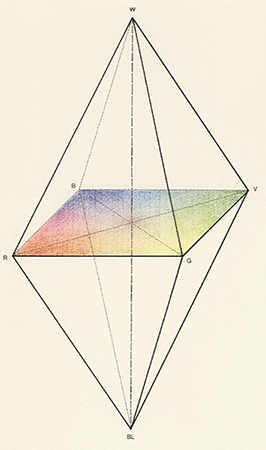 Parkhurst and R. L. Feller, «Who invented the Color Wheel?, Color Research and Application 7», 217-230 (1982); Th. Lersch, «Farbenlehre», in: «Reallexikon zur Deutschen Kunstgeschichte», published by the Zentralinstitut für Kunstgeschichte Münschen, Munich, 1981; John Gage, «Colour and Culture, Practice and Meaning from Antiquity to Abstraction», Thames and Hudson, 1993, (mention and comment), p. 117-120.